The following notes are taken from a previously unpublished JAC document referring to the use of software (TRANSAEM07) used to convert AEM coupling ratios to estimates of apparent resistivity. The GTK/JAC program TRANSAEM is used to calculate 2 parameters of a half-space conductivity model. The program uses the in-phase (P) and quadrature (Q) coupling ratios (in ppm), together with sensor elevation (e.g. RALT=HT) of single frequency EM data and calculates: (i) apparent resistivity and (ii) apparent depth, of the half-space. The method follows the principles introduced by Fraser (1978). The method is a transform/look-up/nomogram (any of these terms could be used) procedure. In principle the apparent resistivity calculation could use a various combinations of observed data: (P, HT), (Q, HT) or, since we have a complex response (AMP, HT), (PHASE, HT) or (AMP, PHASE) where AMP and PHASE refer to the complex response equivalent to P and Q. The various methods are discussed by Fraser (1978) and Beard (2000). In order to avoid introducing elevation errors into the estimation, TRANSAEM uses P and Q to estimate apparent resistivity and then P and Q are used to estimate HT. Apparent depth is calculated as the difference between observed and estimated HT. The basis of the calculation is a look-up table which is calculated once for each frequency. The calculation uses an established forward modelling algorithm to determine the response (e.g. P and Q) of a particular coil-coil system (e.g vertical coplanar coils at a fixed separation and frequency) to a uniform half-space. The response is calculated across a fixed range of altitudes (HT parameter) and resistivities. The files defining the look-up tables for the 4 frequency JAC system were named: ri_two912.dat to ri_two24510.dat. The nomograms (in P & Q) were produced by sampling in Altitude and Resistivity as shown in Figure A25. The number of points used was 2236, and a different sampling was employed for each frequency. A more dense and wider sampling is used in TransAEM07, as discussed later. Estimate AP resistivity and altitude (e.g. Figure A27). The method(s) of interpolation used are not known to us. If either or both the P, Q values were outside the range of the defined nomogram, we think that the value(s) were revised to a value on the ‘edge’ of the nomogram. 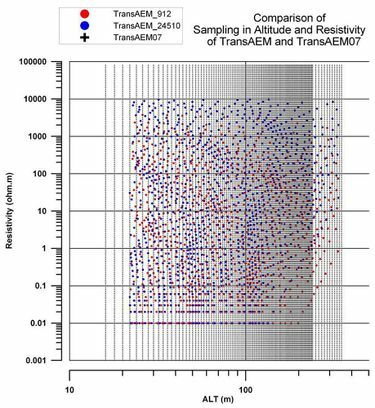 Figure A26 Comparison of sampling in altitude and resistivity of TransAEM and TransAEM07. As indicated in Figure A27, revised nomograms were constructed using a linear altitude range from 16 to 240 m (in intervals of 2 m). 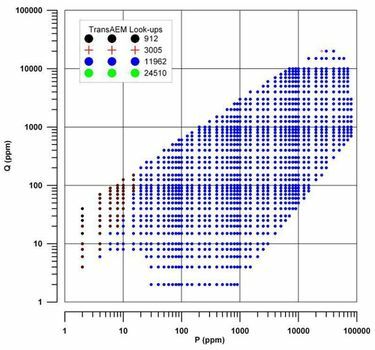 In order to ‘expand’ the range of low P&Q value sampling in the nomogram, a further 11 heights were added between 250 and 350 m (10 m intervals). The resistivity sampling was from 0.001 ohm.m to 80 000 ohm.m using a uniform logarithmic sampling interval of 20 points per decade. The resulting nomogram has 19716 points and the same sampling is used for all 4 frequencies. Figure A27 TransAEM nomograms (digital look-up tables). The resulting files are named RI_JAC_00912_2135.txt, RI_JAC_03005_2135.txt, RI_JAC_11962_2138.txt and RI_JAC_24510_2138.txt. They are ASCII text files with 4 columns corresponding to P (ppm), Q(ppm), Half-space resistivity (ohm.m) and Altitude (m). The sampling in P&Q provided by the new nomograms is shown in Figure A28. The number of points used is 19716 and is the same for all 4 frequencies. Figure A28 TransAEM07 nomograms (digital look-up tables). Although in a practical sense, the range could be restricted to P, Q >1, the complete data set is retained since it allows for regions where one of the components is >1 while its partner is <1. The forward algorithm loses accuracy when values are <<1 and scattering is observed in the nomograms at low P values (Q still valid). 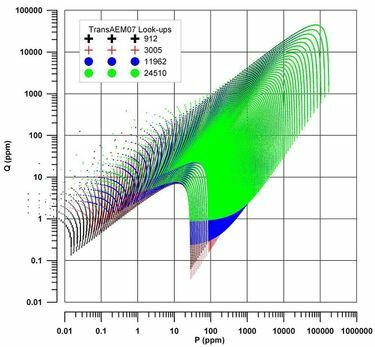 Low value thresholds were used in TRANSAEM, to limit negative and low amplitude data values in P, Q. They are used again here but the general subject is worth a bit of further discussion. Each threshold value is a clipping amplitude, such that all P or Q values less than this value (e.g. Pthreshold, Qthreshold) are set to the value. The user is allowed to set different P,Q thresholds (e.g. Pthreshold ≠ Qthreshold) but it is not recommended. If values below the threshold were truly noise then we could/should(?) exclude them from the input file used by the program, or exclude them from the output file. We choose not to do this, because this would lead to ‘holes’ in the apparent resistivity/depth data sets. This might lead to difficult data sets for both further levelling and gridding. We choose to fill the points where we cannot provide estimates. Assuming we wish to set low value thresholds, and assume that Pthreshold = Qthreshold. The value chosen will simply set the points with P, Q values below the threshold, to have a maximum AP and AD that is a function of frequency. The maximum values are tabulated in Table A3. A different table would have to be produced if we choose different threshold ratios of P, Q (i.e. other than unity). *** Note that threshold values of less than 7.5 produce unreliable results (with the present algorithm) and are not recommended. The following comments are survey/data dependent. They would be different for a simple high- fly or a simple (i.e. small) low-fly survey. However, many surveys will contain a significant percentage of high-fly (low amplitude) data. Thus if we set P, Q to 20 ppm at all 4 frequencies, the resulting AP data and their ideal grids would have maximum AP values ranging from 797 ohm.m at 912 Hz to 11904 ohm.m at 24510 Hz. This can be viewed as something of a frequency-dependent distortion when there are substantial areas where the thresholds are applied. It may not be significant when the number of low P, Q values is small. The effect we see in the table (limited range of high resistivities at the two lowest frequencies) can be seen as a limited resistivity aperture across the four frequencies. Observed P, Q values that extend beyond the region defined by the nomograms may be generated by these additional influences.